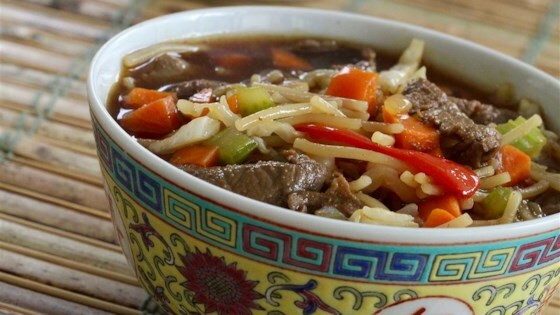 "A wonderful soup for using up leftover steak with a kick of ginger. Try not to eat the entire pot before anyone else shows up for dinner!" Heat oil in a stock pot over medium heat and cook and stir steak until it begins to brown, about 2 minutes; season with onion powder and garlic powder. Stir chopped onion into steak mixture; cook and stir until onion is translucent, about 3 minutes. Stir beef broth, brown sugar, soy sauce, ginger, and sriracha sauce into beef mixture; bring to a rolling boil. Reduce mixture to a simmer, and stir in rice noodles, carrots, cabbage, green bell pepper, red bell pepper, and celery; cover and simmer on low, stirring occasionally, until rice noodles are tender, about 8 minutes. It had a great flavor. The noodles were very mushy which turned the kids off. Next time I'll make the noodles separately, and add them as we eat the soup. Loved it! My daughters ask me to make it over and over! I added 1/2 teaspoon of red pepper flakes. Also 8 extra oz. of beef broth. Very good. This is quite tasty. I didn’t cut the noodles, leaving them intact. I added a dash of white pepper and tripled the Sriracha. Thank you for the recipe.